What to keep you linens bed and breakfast soft? Sandaway Waterfront Lodging in Oxford, Maryland would like to thank Chuck Roller at InnStyle for passing on this Washington Post Article. Because on vacation or at home, you deserve great linens. and should lengthen their life span. linens for bed, bath and table. linens alive with her Vienna, Va., store. A:Every week to 10 days. prefer a crisp, tight weave like cotton percale? so you can get the appropriate size. heavier sheet, not necessarily a better one. Q:Any tips for caring for pillows? pillows; never send them to the dry cleaners. soap and water on a gentle cycle is better. launder bed linens and towels? Q:Tips for keeping a linen closet? for linens, but sometimes that's just not possible. the flat sheet and the cases right on top. The above photo is Tuckaway Cottage at Sandaway in Oxford, Maryland. 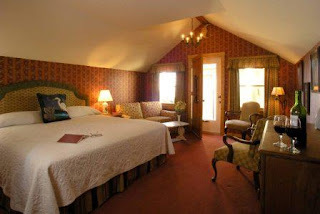 This is one of eighteen bed and breakfast accommodations offered at Sandaway.